It’s December, and the holiday season has rolled around again, and with it a slew of apps on the App Store dedicated to the season of goodwill. 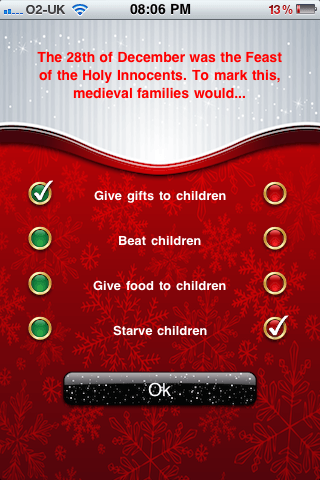 Family Christmas Quiz Pack, from Gok Games, is just one such app vying for your attention this Christmas. So, is this app the gift that keeps on giving, or do we have an early Christmas turkey? 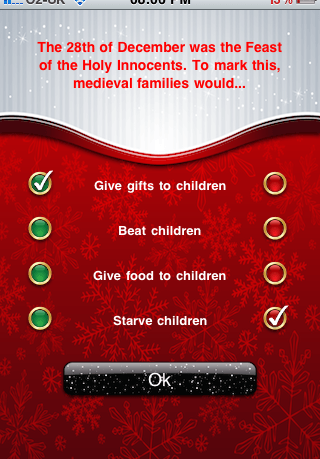 Family Christmas Quiz Pack is a team based quiz game with all the questions based around the festive season. You divide however many people are playing into two teams, pick a category and answer a series of questions, with the app keeping score of correct answers. Answer all the questions and the team with the highest score wins. Questions are of the multiple choice variety, and are probably the highlight of the app with a baffling variety of Christmas trivia, some of which will be complete guess work, but there are enough clever questions with well thought out possible answers to make it possible to figure out the most likely correct answer, which is surely the hallmark of a good quiz. Some of the potential answers are very funny, which is always nice to see. Presentation is ok, with a nice look to the app, and the scrolling Christmas messages in different languages are a nice touch. I would have liked to have had a few more touches like this, maybe some falling snow, or different backgrounds to add a bit more variety. Hopefully things like this are planned for future updates. Sound is minimal, with only a few different sound effects, which is disappointing as a few jaunty Christmas tunes would have gone a long way to adding a bit more atmosphere to the game. There is also a single player mode, in which you keep answering questions until you get one wrong, at which point the game is over. The game doesn’t record your score which is a great shame and means that you will probably only play this mode once or twice. If the game at least displayed your best score, the replay value in this mode would increase ten fold. Value is added when you consider that the main multiplayer mode has ten quizzes to choose from, and with many questions in each, there is enough content here to while away a couple of hours at Christmas. Playing the game with the whole family is great fun, and is a guaranteed to put a few smiles on the kids faces. Overall, all the negative points about the presentation and lack of high scores are not enough to take away from the fact that this is a really good quiz game. It gets the most important thing right: questions, and has enough content to make this a worthwhile download. The fact that you might actually learn a thing or two about Christmas is testament to the quality of the quizzes offered here.